Feb 16, 2013 | From the kitchen of Rose, posted here. 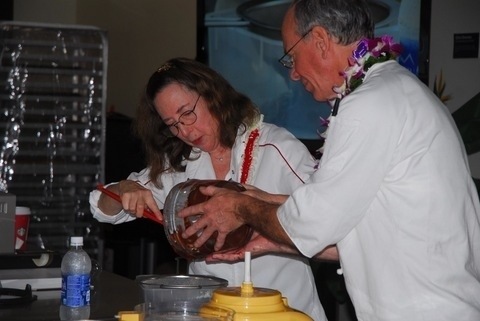 I was thrilled when Hayley Matson Mathes invited me to give a baking demo in Honolulu. 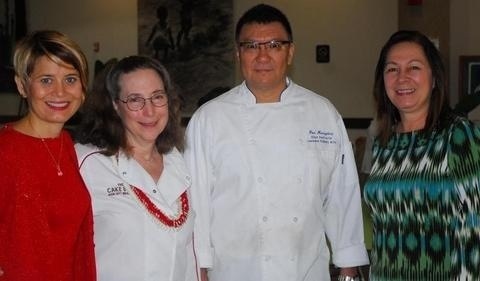 Hayley is executive director of the Hawaii Culinary Educational Foundation, a charitable organization that brings in chefs from all over the world to give classes and workshops to culinary students. She and her charming husband Mike were the best of hosts. They picked Woody and me up at the Honolulu airport and brought us to the Halekulani 5 star hotel at Waikiki beach, with a glorious ocean view from every room, where Haley arranged for us to stay for two nights. I don’t know how Hector managed it, having been with us in Kona up until that morning and doing most of the prep for the upcoming baking class, then making us a tasty Peruvian dinner of Hake fish with rice and a sauce of Aji Panca marinade: vinegar, cumin, garlic, oregano,aji panca, and a touch of soy sauce. (Aji panca is a Peruvian dried chili pepper which gives a dark red color and has almost no taste. It is similar to paprika. ), and onion salad. For dessert, the “Hector’s Take on My Cake” chocolate oblivion made with avocado instead of butter. If I hadn’t spotted a tiny bit of avocado green I never would have suspected it was there! 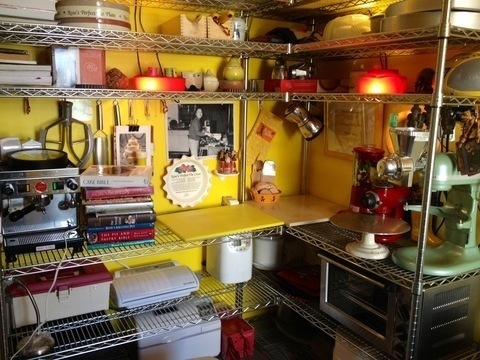 In the Yellow Kitchen, Hector has established his personal signature with as many appliances and tools as possible in yellow. 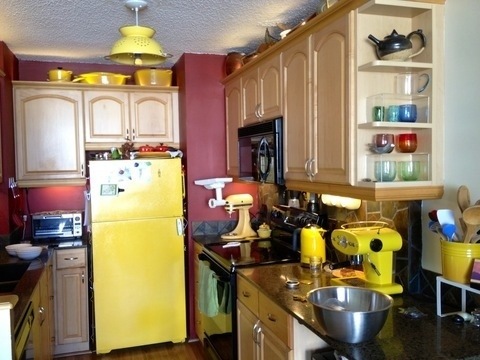 Christopher even painted the frig yellow and made a hanging ceiling light from a yellow colander. The second bedroom is set up as a baking studio. It was quite amazing to see how much Hector could fit into this space. Even the inside of the cabinet doors have brackets for tools to make more storage. Early the next morning Haley and Mike drove us to the Leeward culinary school where we were introduced to Tommylynn Benavente, Leeward Community College Culinary Arts Program coordinator, and Donald Maruyama, Leeward Community College Culinary Instructor. 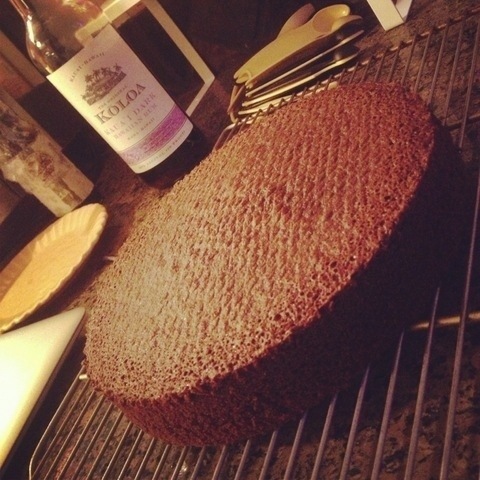 Hector prepared a “Deep Chocolate Passion” cake already frosted with a smooth undercoat for glazing, the Lacquer Glaze heated to the perfect pouring temperature, and the mis en place for all ingredients, weighed and labeled. He also prepped the Golden Almond Cake, replacing the almonds with macadamia nuts so that we could try it for the brunch he was planning for the next day. (It was even more delicious than with almonds.) Woody handed out index cards for the students to write out questions for the Q & A at the end. Hayley had encouraged me to talk about my background and the route I took to become who I am today to inspire the students. So by the end of the demo, the students felt comfortable enough to ask questions out loud as well. One student asked about my biggest influence and without thinking twice I said Buddha! Another asked who was my favorite baker and again without reservation I called out “Hector,” and this gave us the perfect opportunity to hand him the Cordon Rose School diploma which Woody designed especially for him.) Woody was my right hand during the demo. 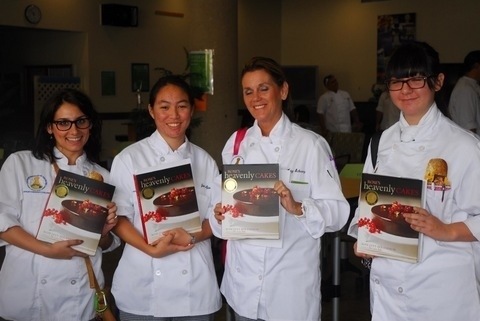 Despite being in the midst of final exams, 80 food science students and professionals attended the demo. It was most gratifying that they were exceptionally attentive and appreciative, and when Haley forwarded the ‘ratings’ they were all 100% positive. The demo was followed by a book signing. Haley brought in several copies of Rose’s Heavenly Cakes, and I had asked her to encourage the students to bring any books they already had. 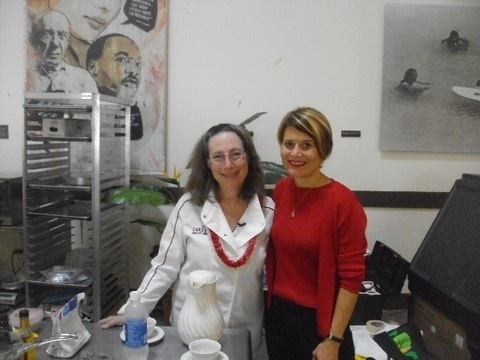 By the end of the demo and signing, when I had hardly any voice left, I was treated to an interview with Joleen Oshiro, Food and Arts reporter for the Star Advertiser. Her questions and comments were so fascinating I found just enough voice left to squeak some responses. 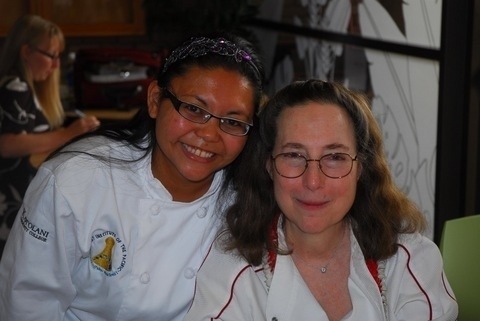 She is now working on a special profile of Hector, about how he learned to bake from my books to the point where he could adapt many cakes using Hawaiian ingredients, and his unique artistry in decorating them. 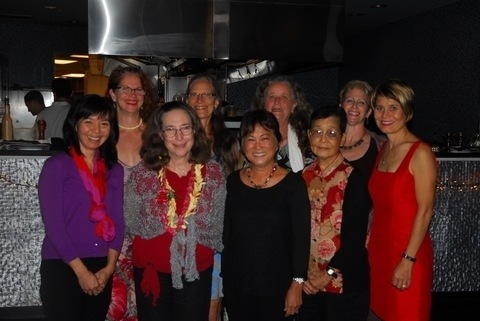 After two hours of rest, and a walk by the ocean, we were whisked along to have champagne at Hayley and Mike’s stunning high rise and then on to a special dinner in my honor given by the delightful Hawaiian chapter of Les Dames D’Escoffier at the Stage Retaurant. Hector’s date was his aunt Lavina Ho who had given him The Cake Bible in 1989 when he had moved from Peru and spoke very little english, which did not stop him from baking his way through the book! I had received so many orchid lei I stopped counting but the most beautiful lei was the one lovely aunt Lavina hung around my neck–it was composed of tiny rosebuds . Next posting: Brunch at the Yellow Kitchen, visit to Pearl Harbor, and return to Kona.